During the twentieth century, an increasingly diverse range of buildings and spaces was used for theatre. Theatre architecture was re-formed by new approaches to staging and performance, while theatre was often thought to have a reforming role in society. Innovation was accompanied by the revival and reinterpretation of older ideas. 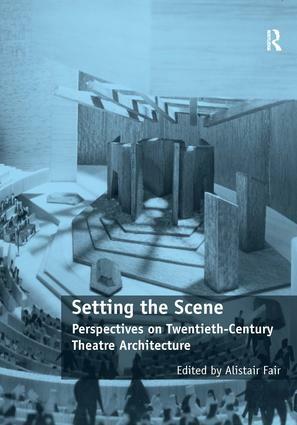 The contributors to this volume explore these ideas in a variety of contexts, from detailed discussions of key architects’ work (including Denys Lasdun, Peter Moro, Cedric Price and Heinrich Tessenow) to broader surveys of theatre in West Germany and Japan. Other contributions examine the MalmÃ¶ Stadsteater, ’ideal’ theatres in post-war North America, ’found space’ in 1960s New York, and Postmodernity in 1980s East Germany. Together these essays shed new light on this complex building type and also contribute to the wider architectural history of the twentieth century. Dr Alistair Fair is a historian of twentieth-century architecture with a particular interest in public and institutional buildings. After studying at Oxford, the Courtauld Institute of Art, and Cambridge, he worked in architectural conservation before returning to Cambridge as a Research Associate and then a Leverhulme Trust Early Career Fellow. He joined the University of Edinburgh in autumn 2013 as a Chancellor’s Fellow. He has published widely on aspects of university, hospital and theatre architecture, including co-authorship with Alan Short and Peter Barrett of Geometry and Atmosphere: Theatre Buildings from Vision to Reality (Ashgate, 2011).